Promotion is a critical component of anything you want to raise awareness about. You wouldn’t spend your time and energy coordinating a birthday party without promoting it. What would be the point? You’d be the only one there, and that’d be a sad party. 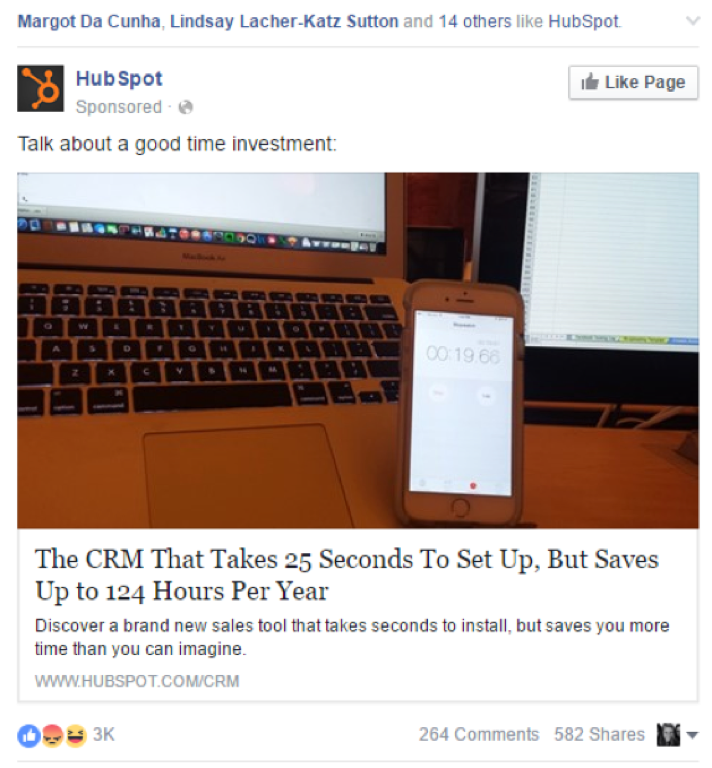 Learn how to promote your content with these free HubSpot Academy resources. Jafri’s quote doesn’t necessarily mean create less content as much as it does to find ways to be more efficient with it by repurposing and promoting it. Let’s start off with the short-term tactics. 1. Insert links to your content on relevant, high-traffic pages on your website. When creating a new piece of content, a quick way to get traffic to the page is to insert a link on other relevant pages of your website. For example, I created a page on how to become a digital nomad. The top-trafficked page on my website, Wild We Wander, is how to build a DIY truck camper. 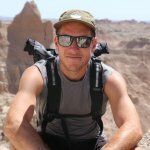 These two topics are interrelated, so I added a link on the DIY truck camper page to direct people to the digital nomad page. From a search engine optimization perspective, it helps to create a cluster of related content by linking like-themed pages together via hyperlinks. 2. 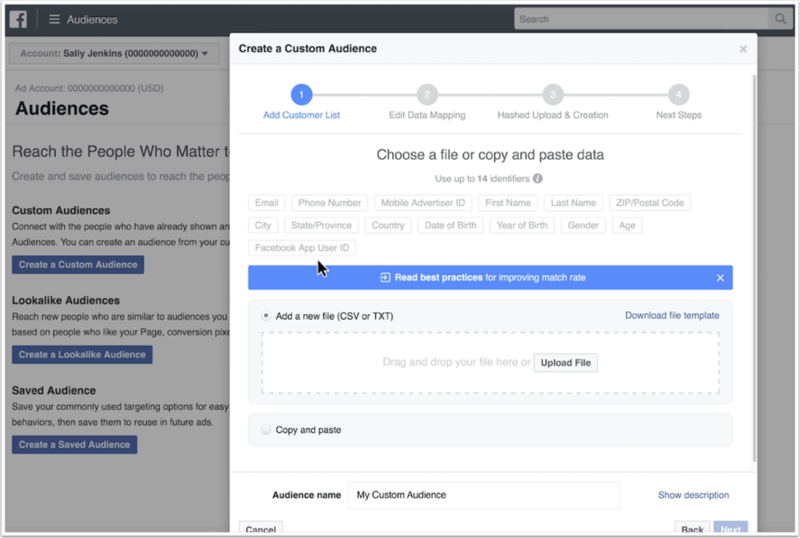 Upload relevant emails to Facebook and create a look-alike audience. Create a look-alike campaign on Facebook to match one to two percent of your target demographic. By setting your custom audience to match one to two percent, you’re ensuring your look-alike audience closely resembles your persona. This is a great way to target new prospects based on similarities with your existing customers, rather than based on keywords they’re searching for on Google AdWords. 3. Create a series of social posts using interesting snippets from the content you’ve created. You know you see lazy tweet(s) when a company tweets the same title of an article or downloadable content offer as opposed to the value you’re going to get out of it. SmartBug Media, a digital marketing agency created a downloadable offer titled, The Definitive Guide to Inbound Marketing Personas. SmartBug promoted the guide week-after-week on their social media channels by using snippets of content from the guide to keep each post fresh. Take this tweet, for example. 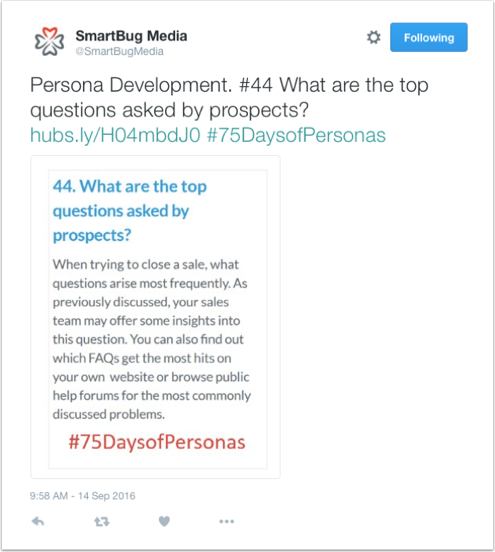 It explains persona development tip #44, “What are the top questions asked by prospects?” Notice how SmartBug included an image, link to the guide, and a hashtag—#75daysofpersonas—to track campaign results. Nice touch. 4. Reach out to people who linked to similar content. What I love the most about the digital age is that it’s easy to perform research and dissect information from content that performs well online. For example, you can go to a tool like majestic.com that offers information on inbound links, and download a list of links to sites that linked to similar content that you’ve created. This way, you can send an email to each source and let them know about the content you’ve created. You can’t expect them to promote or link to your content, but what you can do is be helpful and let them know it exists. People are always looking for great content to share if it’s going to bring value to their audience. 5. Comment on five relevant blog posts on authoritative websites. The comments field of a blog post is the best way to engage with real people on topics on which you may be able to provide value. You may be tempted to talk about your business, and even share a link to your website’s content. Hold off on this unless it makes sense and provides extensive value. Remember, you’re communicating with real people. No one likes that person at a party who’s only talking about themselves. Take the time to read what others are saying and respond with value. If you have something interesting to add, then others will come to you. Okay, now that you have some ideas on some quick prescriptive wins, let’s move on to tasks you can do to achieve success in the long term. It takes time to build relationships with people, and I don’t just mean online. Before reaching out to someone you want to collaborate with, especially if they’re someone who’s authoritative, try engaging with them on social media. This will make it that much easier when reaching out to them in the future. 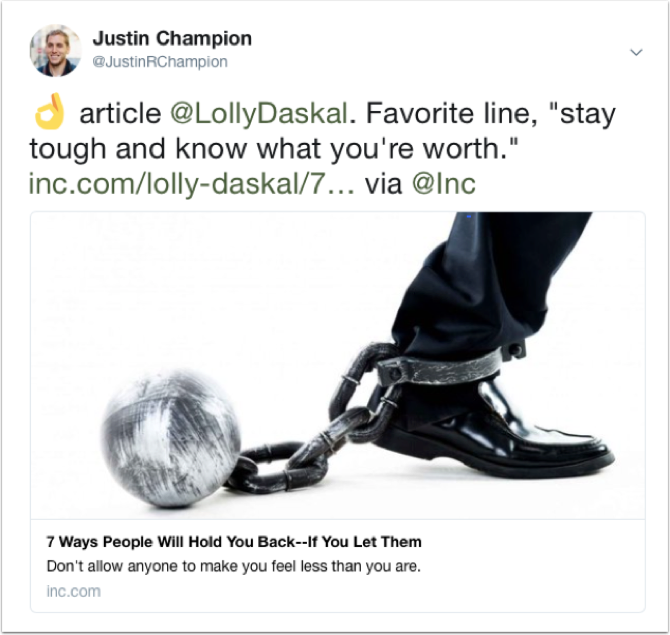 For example, Lolly Daskal, author of The Leadership Gap publishes a lot of interesting content in a variety of places online. One article in particular caught my attention, so I tweeted about it and tagged Lolly in the post (this way she’d see it). 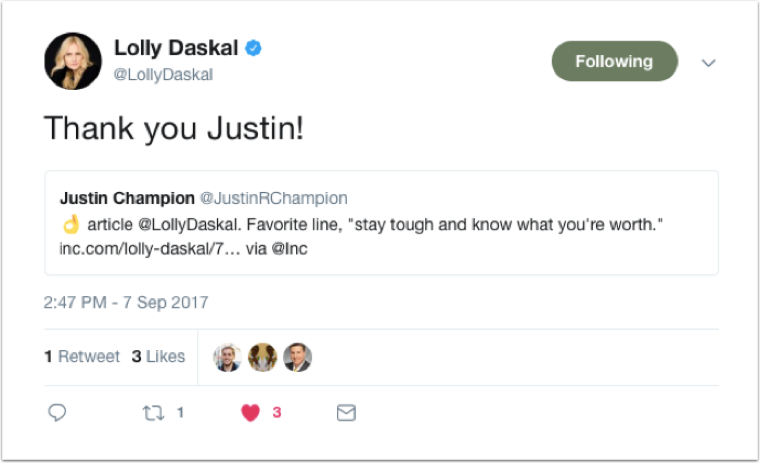 Later that day, Lolly responded to my tweet. Now Lolly knows who I am. But just one tweet isn’t enough. The best way to stay top of mind is to continue engaging with this person and on different channels—like commenting and engaging on their blog posts and other social channels. Keep in mind, though, don’t go overboard. The goal is to stay top of mind, not be creepy and come off as a stalker. One of the most effective ways to grow your thought leadership online as well as acquire inbound links is to guest blog on relevant websites to your own. If your website authority is fairly low (let’s say under 10), then you should be writing guest blogs more often than blogs on your website. Doing so will help increase your website’s authority. 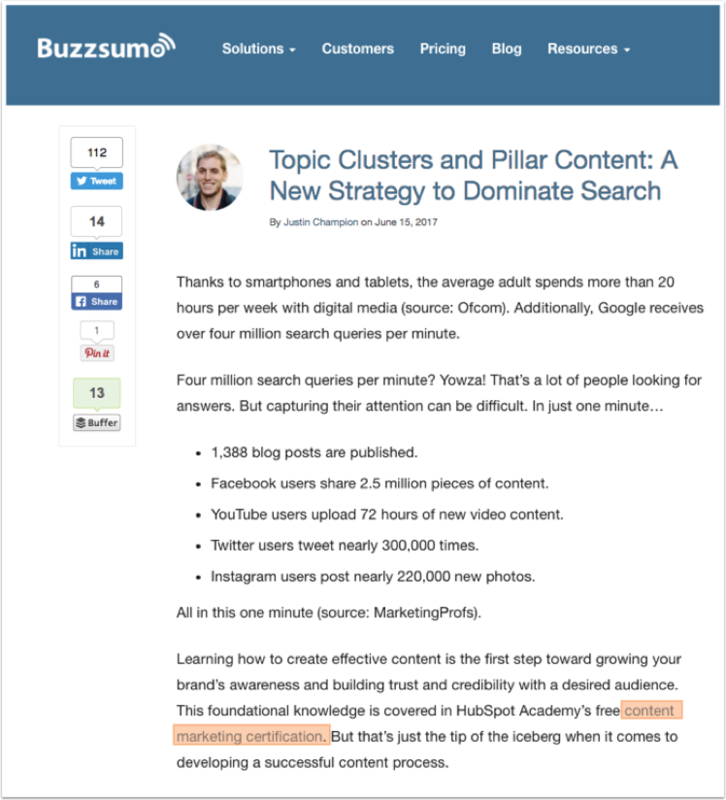 Here’s an example of a guest post I wrote about content marketing strategy for Buzzsumo. Notice the link in the fifth paragraph? This link refers people to HubSpot Academy’s Content Marketing Certification. However, the content in the article focuses on content marketing strategy, not HubSpot Academy. Write quality industry-related content, not content about your business. For new guest bloggers, it may be difficult to find guest blogging opportunities. The best thing you can do is have a portfolio of links to serve as writing samples and offer ideas for content that would be a good fit for the website you’re reaching out to. Here’s a helpful resource when it comes to learning how to become an effective guest blogger. If you publish a top-performing piece of content, consider republishing it on other reputable sites like LinkedIn and Medium. Chances are if it performed well on your site, then it’ll perform well on others. 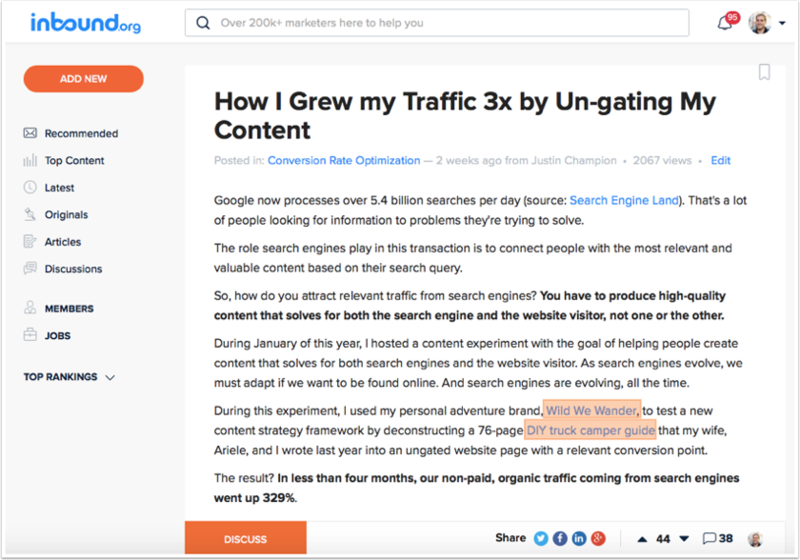 The Buzzsumo post I wrote performed so well, I decided to repurpose and republish the content on inbound.org. And guess, what? It performed really well on inbound.org, too. In fact, it has been the highest trafficked post for three weeks. Notice the links in the fifth paragraph? These refer readers to my Wild We Wander website to learn more about the examples I’m referencing. Another valuable inbound link opportunity. With social platforms often pushing advertisers towards impression-based ads, using high-converting content becomes even more crucial. If you’re going to boost a social media update with ad dollars, you better make sure it’s worth it. Let’s take a look at this example Facebook post from a small, family-owned business that’s grown an engaged online community, Mountain Mystic Company. In this post, Mountain Mystic is announcing their Magical Mystical Box, an item they created to capture the feeling of being in the shop for those who have never been in one before. It’s also important to mention that this item was a test that Mountain Mystic used to launch their e-commerce store on mountainmystic.com. They’re talking to their audience in a human way, letting them know how much they appreciate them. Yes, they explain what they’re offering in the second paragraph, but they’re focusing on their audience first, making it conversational. The post started to catch traction, so Mountain Mystic promoted it to their audience of 1,700 fans for less than $25. The result? 35 valuable comments from others explaining their experience of what it’s like to visit Mountain Mystic. Most even went above and beyond to explain why they love the shop. And as for their e-commerce test? 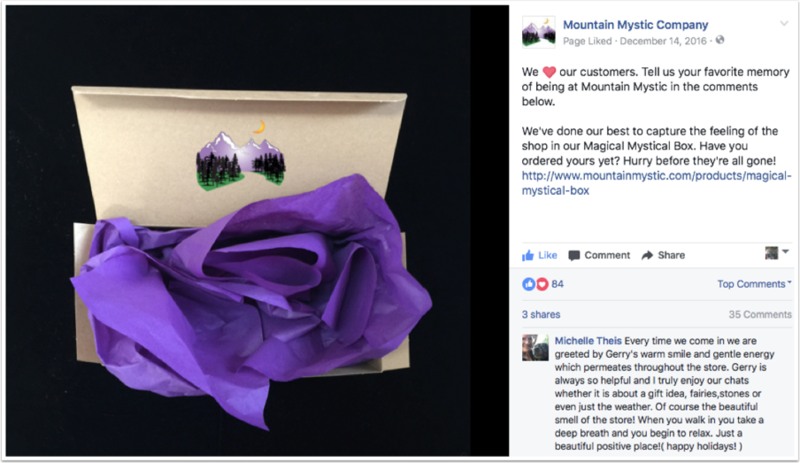 Mountain Mystic sold out of all their Magical Mystical boxes during pre-order. If you have an ad budget and you’re looking for ways to efficiently spend those dollars, then consider creating ads that target people who visited content on your website but didn’t complete the conversion action on the page. This way you can advertise to people who visited your site on other channels like Facebook, Instagram, or the Google Search Network. This process requires a bit of work, so here’s a resource that explains how to get started with Google remarketing. I’m a nerd when it comes to repurposing content. That’s because the best way to create great content, and a lot of it, is to spend your time and energy creating a great piece and reformat in to live in different places. Repurposing content not only allows you to reach a new audience by offering a new piece of content on a new channel (like a guide repurposed into a slideshare deck), but also, and, more importantly, it allows you to claim more search engine real estate for your top-performing content. The act of repurposing content is an art form, and it takes practice. Here’s an article which explains some examples to wet your palate on repurposing content ideas. And there you have it, 12 content promotion ideas to get the word out there on the content you’ve created. And remember, don’t expect people to stumble upon your content. Spend more time repurposing and promoting it than creating it. Want to learn more about how to repurpose and promote your content? Get a copy of my book, Inbound Content: A Step-by-Step Guide to Doing Content Marketing the Inbound Way.